Is there a better alternative to Warehouse? Is Warehouse really the best app in Backup category? Will Warehouse work good on macOS 10.13.4? 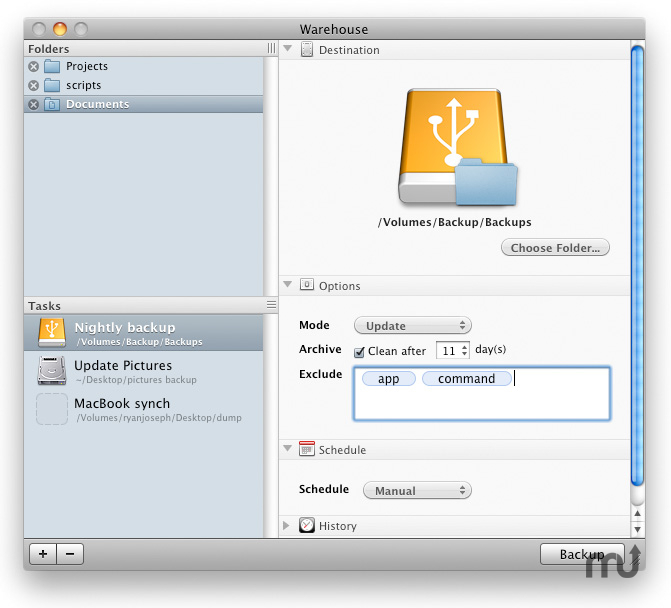 Warehouse offers a lightweight single window interface for backing up files from your Mac to any removable media device such as external hard drives, USB memory sticks or even other Macs connected on a network. As a more fine tuned method than TimeMachine's one size fits all approach, Warehouse uses a task based system which lets you create an unlimited number of tasks each with source folders, destination location and an option of 4 unique backup modes. Fixed a nasty bug which caused the time of controls to not save properly at times. Fixed another nasty bug which caused weekly scheduled backups to use the wrong time. Folders are prevented from being deleted during transfers thus causing a crash. Added a progress wheel to transfers. Schedule Backups. Warehouse lets you schedule tasks to run in the background (using a variety of scheduling options) so the application itself can usually remain closed while it backs up important files quickly and quietly while you work. Incremental Archiving. Dated folders containing only changed files are incrementally backed up thus saving disk space. If you want to restore old archives browse them like other folders in the Finder and copy out files you want restored. Synchronize Folders. Easily synchronize the contents of two folders on any destination by transferring only newer files to each destination. The perfect solution for keeping your desktop at home in synch with your laptop at the office. UNIX at the Core. The core of Warehouse uses stable and trusted UNIX utilities so you can trust your data is safely transferred in the most efficient way possible. Dragging a folder onto the Warehouse application icon in the Dock will create a new task with the folder as the source. There is a basic meter showing the amount of disk space available on the destination disk. If you hover the mouse over the image a contextual window will appear giving more specific details. When manual backups are performed in the Warehouse application a progress wheel will be drawn over the icon in the dock. There is a new exclude hidden files option which will exclude all files/folders starting ". ".